dresdencarrie: Like to save $$? So I did some research after seeing a blog post somewhere...sorry I don't remember where it was from...about homemade laundry detergent. I hate buying it at the store cause it always seems so expensive. But at first glance I was worried the homemade kind would be too harsh on my clothes so I did some more research. I found out a lot of great things about the homemade kind and that it isn't harsh and is in fact a great stain treater. I showed my husband and he kinda thought I was nuts but then I told him how long one batch lasts and he was all over it. See my husband is a penny-pincher, in a good way, he's taught me how to save our money and I am so happy for his knowledge. I found a local ACE hardware and was grateful to find that they had all the ingredients (only 3, not bad)! I was so excited to make it and try it out, but also a little nervous. After 3 loads of laundry since making it I am very impressed. Our clothes are very clean and in great condition, I really couldn't tell a difference from my normal Tide to this homemade stuff. Plus it smells very clean. So I'll quit babbling and get to the point. Here are the pics and the recipe follows. Let me know if you try it out, I'd love to hear about it. Enjoy! Ingredients: Arm & Hammer Super Washing Soda, Borax, & 1 bar of Fels Natha Soap. If you cannot find the Fels Naptha at a local grocery store or ACE hardware I know you can find it online, with shipping it's like $3 or $4. Combine all ingredients, I recommend doing it outside because it gets kinda dusty. Use 1 T for a small load and 2 T for a large load. If you are washing clothes that are particularly dirty I would recommend adding a tiny bit of regular detergent. We work inside so our clothes don't get that dirty, so with kids or husbands that work outside you may want to revise this recipe. I couldn't resist a picture of the grated up soap, it looks even better bigger! The finished product, I put mine in a large mason jar for storing next to the washer. 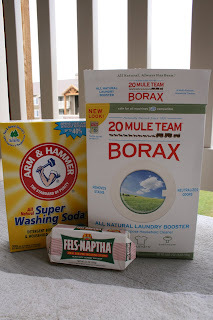 The project ended up costing me about $11 but the washing soda and borax will last me for at least a year, probably more since there are only 2 people in our home. So when I need more laundry detergent (I'd say in another 6-8 months at least) I just need to buy a bar of Fels Naptha-about $2 at ACE. Good deal if you ask me! This last weekend my mom was up and we did A TON! I am getting ready for a boutique the first weekend of November and I've had a lot of sewing to do between work and school and homework! Luckily my mom is amazing at picking out fabrics! I showed her where my fabric box was and she started cutting so all I had to do was sit at my sewing machine and sew. There is no way I could have done as much as we did without my mom, thanks again mom :). I'll get you a sneak peek in the next few days of what I've been working on. Let me know if you want to come to the boutique and I'll get you directions, it's gonna be fun!